Despite the resolution of UN Security Council to have one month cease-fire in all Syria, the Turkish army supported by the criminal Islamic terror organizations and gangs have intensified their war against Kurdish Afrin. 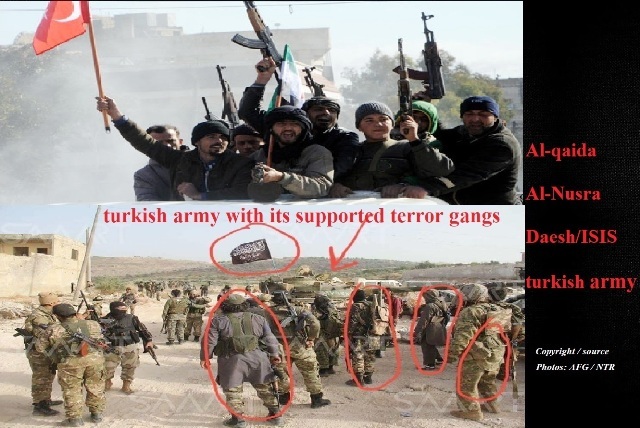 Brussels, 4 March 2018 - Middle East Diplomatic (MED) - Despite the resolution of UN Security Council to have one month cease-fire in all Syria, the Turkish army supported by the criminal Islamic terror organizations and gangs have intensified their war against Kurdish Afrin. UN Human Rights organizations, Amnesty International, Syrian and Kurdish humanitarian organizations receiving daily reports from Afrin of civilian deaths and injuries, and restrictions on civilian movement as a result of ongoing Turkish and criminal islamicg gangs military operations. In a newly released statement, Panos Moumtzis, Regional Humanitarian Coordinator for the Syria Crisis, regrets the current situation in Afrin: “I remain deeply concerned for the safety and protection of millions of civilians across Syria, one week after the UN Security Council voted in favor of Resolution 2401, calling for a one-month cessation of hostilities across the war-ravaged country. We continue to receive disturbing reports out of Afrin of civilian deaths and injuries, and restrictions on civilian movement as a result of ongoing Turkish military operations. Those who risk moving continue to be stopped at exit points by local authorities in Afrin, preventing them from accessing safer areas. To date, an estimated 5,000 people have reached surrounding villages and Aleppo city, while tens of thousands more are now believed to be displaced within Afrin”. According to the Center for Strategic Studies in Rojava (NRLS), officials in Afrin Canton and the Kurdish Red Moon: “Since the beginning of the attacks on Afrin, the schools of the region have been under constant fire from the Turkish army and its Islamic-gang militias”. According to estimates, around 50,000 children are deprived of their right to education, because of the attacks on Afrin. As a result of the Turkish war of aggression against the northern Syrian canton of Afrin, the occupying Turkish army and IS/Al Qaeda militias recruited by Turkey have so far bombarded 31 out of 318 schools in Afrin region. 13 students were killed in attacks. Among the bombed schools is a school in the Rajo district, which was founded with funding from the United Nations Children`s Emergency Fund (UNICEF)”. "Afrin operation increases risk to the campaign to defeat ISIS"
Speaking to the US Senators in the Congress, General Joseph Votel, the commander of the U.S. Central Command said that the battle to prevent a resurgence of ISIS or similar groups, however, will take a sustained and focused effort and warned that the Turkish incursion into Afrin is distracting from this goal. The co-chair of TEV-DEM (Movement for a Democratic Society in Rojava / Northern Syria) Asya Abdullah believes that “the invasion operation on Afrin is a result of agreement with Russia. The political decision of invasion and policy of massacre were given by Russia and Erdogan practices its terror part. Russia is responsible for these attacks. This is not a secret”.